HACKIE REITMAN, M.D. 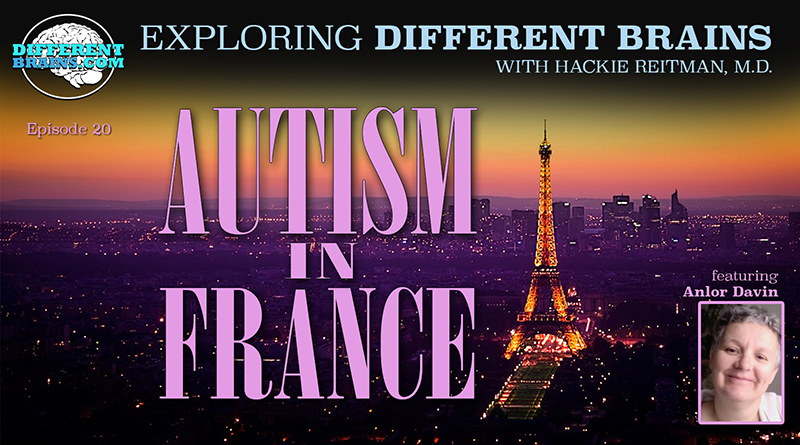 (HR): Hi I’m Dr. Hackie Reitman, welcome to another episode of exploring different brains, today we have the honor of interviewing Becca Lory, herself who has Asperger’s and is the leader of the organization you’re going to learn about today called GRASP. Becca welcome. BECCA LORY (BL): Thank you very much it’s my pleasure, I’m excited to be here. HR: Now I want to ask you this, I’m going to read from this, the GRASP vision statement says you are helping individuals become “Self determined, respected, valued, and fairly represented.” Would you say you have personally reached those goals and if so what were your biggest roadblocks? BL: I would say for myself as someone who has always had a loud voice with a theater background I have zero problems with asserting my opinions to everything, so I’ve done most of those things for myself. Do i feel that it’s done for the community and it’s finished for the community? No. Do I feel that GRASP is working it’s way to making that a possibility? Yes. But much of that is a learned skill to say that she’s overwhelmed a lot of it is teaching people that they have value and teaching them to be self determined because the autistic brain I loved that we become autism spectrum disorder and could call the nonverbal people on the spectrum and the people who we call low functioning which is not something I like either, I could call them my brothers and sisters they were part of my community as well I think its fantastic that were all together, it makes our numbers stronger, it makes our voice louder, so I don’t call myself an Aspie anymore, I call myself autistic because I want people to understand that I respect those other autistics as much as I do myself. So I don’t think were quite there but without teaching people how to do that it doesn’t happen. BL: I had written an article about that actually because i am of the opinion and this is my personal opinion, it has nothing to do with GRASP or anybody else, I am of the personal opinion that that’s a foolish tree to be climbing basically. When you look back at history and you look back at the civil rights movement and you look at the LGBT community and you watch how they got themselves their rights and their voices heard and the stigma reduced and all of those things, essentially the same path was followed, what it meant was lighter skinned black people did not dismiss darker skinned black people. And the lesbians didn’t dismiss the gay men, they became a community and to me that’s exactly what being able to say were and ASD community does. I get to say I have Asperger’s but that’s just part of the spectrum. HR: What were trying to do at different brains is even go a step further. To say look, none of these things exist in isolation, if you have Asperger’s you’ve also got anxiety, you may have PTSD, one in thirteen Americans have that. You may have ADHD you can name all the initials you want, you may not also. 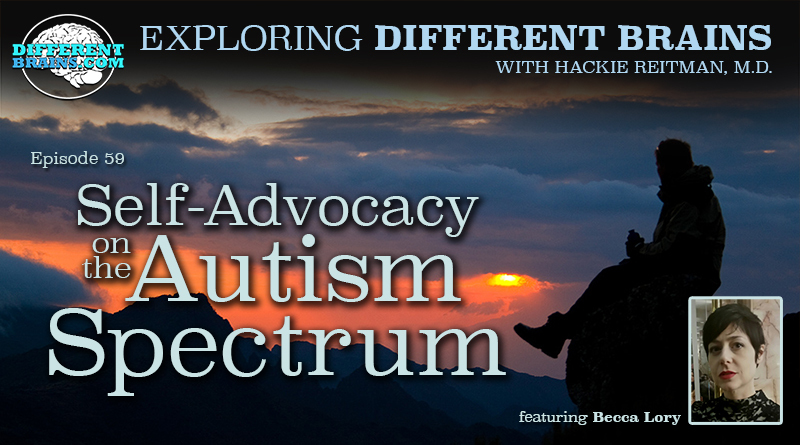 We are all on a giant spectrum, not just an autism spectrum. When you start throwing in bipolar, schizophrenia, because more and more were finding the wiring in the brain is actually physically shown on studies different and the good part is we can now show there is neuroplasticity where we can rewire the brain through such simple things also as proper diet, exercise, so on and so forth as well as behavior and many other. BL: I completely agree with you, the one thing I usually try when I do a public speaking engagement is to remind people that if you want to use the CDC numbers and say HR: in 88 people is on the spectrum, that means if you’re sitting in a room of HR: 00 people, someone in there has it. That’s it, were not talking about something people can’t visually see when they’re having a presentation, but on top of it you also get to say there is a reason I’m on the spectrum because I’m on the spectrum it exists if there wasn’t off the spectrum there wouldn’t be on the spectrum, so If we stop saying that then we’d all admit even people who are technically not on the spectrum are still part of the spectrum. HR: You know right now, it’s kind of like being gay 50 years ago, you stay in the closet, it’s much safer. No stigma, you can pass for neurotypical and why fight it. This is a trend now and I think it’s so positive and I think that as with many things, the women are going to have to really lead it. BL: Well I think it would be really phenomenal to be able to do that. I think our goal is not that you want to hide it but learn to function with it. Really having a spectrum brain means that you filter the world differently. You intake information your brain filters that information differently and you process it differently. It doesn’t mean your not human it doesn’t mean you don’t have faults it doesn’t mean that you aren’t really good at some things too. It doesn’t mean any of that stuff. You’re a person but you’re also a person who has a brain that’s different. And that doesn’t make it anything wrong and what I love about it is that the women on the spectrum because we’ve learned how to pass, we get to have this experience where you’re talking to somebody and you’re having a conversation and you’ve decided to not lead with your Aspie foot, I always say I don’t lead with my Aspie foot all the time, you go to a networking event or a cocktail party or you go to a family event, oh how are you? here are the general questions, hi how are you, I’m fine. No one actually cares about your answer that’s a neurotypical thing, they hug you, I don’t even know you, why are you touching me? Another neurotypical thing that I don’t understand. and the first thing people say is to you is well what do you do for a living? And I get to explain I work for an organization called grasp that supports adults on the spectrum with education and programming and we do support groups and I work with that all day and we’re hoping to be able to make the world more comfortable for people on the spectrum. And most literally happened to me, I tell this story often because it’s hilarious to me. This one women did the lean in and the arm on the shoulder and said that’s so amazing, you do such good work, how do you talk to those people all day? I said oh well we’ve been talking for BL: 0 minutes and she said yeah, and I said well how was it to talk to me for BL: 0 minutes? and this moment of oh my god but you don’t look like you have autism and I said oh that’s so fascinating, what does autism look like? and it’s like oh and you start to create the challenges in the conversations it’s like oh yeah, you’re not going to see it. Most of my challenges are not things people can see. So they would never know, and I don’t want to go to cocktail party where you don’t care how I actually am and I tell you anything, I really don’t. That information is reserved where it can be educational and it can be useful to people , otherwise go have your glass of wine and your crackers and cheese and I’m going to say hi to the person’s cat and say it’s nice to see you and I have to go now and I’m going to leave and that’s it. But all of those coping mechanisms all of those learned things, I either learned them because I made the mistake enough and said that’s not working let me try something else or I had somebody literally teach it to me because my social brain does not absorb the social information, I need it to be taught to me the way everyone is taught algebra, so It’s that kind of thing is this social appropriate? I never knew for years, for years what are you supposed to wear to a certain event, I would always would have to check in with my mom, I needed a neurotpical in my life, If I didn’t have one I would have had no idea what I was doing. So I would say is this a wear a skirt and heels event or can I get away with pants and shoes or can I get away with jeans and nice sweater? How fancy is this event, that’s not something I would ever know, I happen to be wearing a blue shirt today but most of the time I wear black not because I’m not trying to make some kind of goth statement but because black matches everything and I don’t screw up and look like a clown, there are little things I do to just make my life easier. BL: Well most of the time you can find me in front of my computer busting my behind for GRASP so you can go to www.grasp.org and you can probably find me through there were currently redoing our website in construction on it at the movement because I was unhappy with some things. we’re kind of updating ourselves, you can email info@grasp.org the email will make its way eventually to me, they all go there and then get to the individual. I do have Facebook it is me, sometimes your gonna catch me on a day that I’m posting about my cats or some cat meme that is funny to me or just saying today sucked today I went to the supermarket and I hate the supermarket and so be and other times I’m posting really well vetted article, I’m very involved in the research contingent piece of what’s going on in the community right now, I think research is skewed towards men and boys and I think there is a reason it is skewed towards men and boys and it’s not the fault of the researchers and I’d really like to see some research on female focused. At least any gender research not just male gender research. And I think our numbers would probably change, I think instead of getting that one in four number, we get all the time we’d get a fifty-fifty if we were able to collect the data. It’s sort of just saying we need women specific research and I’ve really been working that way. HR: What is the make up of the organization and the participants you get? is there a break down by gender or no? BL: No. We take it for data, its part of your sign up form so we kind of know what it is. BL: It’s HR: 8+, that’s it. HR: 8+ and we help parents we help educators we help adults on the spectrum of either gender, any age. were starting to work down further to the younger adults independent living skills earlier by the time they get to be an adult age they get kicked out of the system they don’t know what they’re doing so were trying to get into that a little bit. HR: That’s really a fine line you walk there in the sense that we have inadvertently through our great intentions discriminated against adults is always about the children but the children become adults and as a result the adults many times had no where to turn but now of course we find that of course the earlier the intervention but when it comes to independent living financial literacy, employment, all of these adult things we have to start at much earlier too. BL: We do, and I think that’s a general population thing, lots of kids should not go to college with out learning how to do their laundry but it’s different learning style to teach it to someone on the spectrum, however I also am just thinking that right now is the time. we’re sitting at the apex of a situation, we had came into the system at 1994 Asperger’s hit the books so we had bunch of people who got diagnosed around the early 90s as young children and we started providing support so they grew up with their knowledge of their diagnosis through out their life and then you have the people who found out as adults and never had supports who are sitting out there on the spectrum and what’s happening now is that our colleges and employment centers where they’re going to get their very first job getting kicked out out of their pediatrician and they’re ready for an adult doctor and all of those kids who were young children in the 1990s are now sitting in our adult population, its huge because those kids were diagnosed. I always say it and I will say it again, Autism will not kill you, it is not disease that will kill you, you’re not going to die from your autism, you’re going to die from something else, but you’re not going to die from your autism. You will become an autistic adult, it’s not a childhood disorder anymore we don’t think of it that way. Some people get stuck and it’s a little bit stuck being a male disorder than being a childhood disorder but it’s starting to be more understood and I think that’s the platform we need to come from, we always say assume competency that’s what Kate Palmer and I always say. Assume competency assume someone can do this thing let them try, if they are not competent teach them how. It’s that simple. HR: Becca Lory it’s been such a pleasure speaking with you but before we wrap up, as you are the director of grasp and you’ve been so chalk full of Aspertools, all of our audience can use especially our female audience, what is one important essential piece of advice you could give to the female Aspies and everyone else who is listening here direct form you Becca Lory to them here at differentbrains.com ? BL: It’s going to sound very simple but it’s one of the most difficult things for almost everyone to do, don’t be afraid to ask for help, that’s it, if you’re struggling if you’re feeling challenged, if you don’t know what to do about something, don’t sit there and worry about it and just say this is hard for me I don’t know what to do but can you help me, because only intelligent people ask for help. I think if women in general gave themselves the value to say I deserve to do this right and I deserve your attention, but also people on the spectrum we’ve been treated as children for many of our lives, a lot of us might be ashamed that we don’t know how to do something that is very basic to everybody else so our voices got silenced. And our beginning piece to self-advocacy to self peace and independence is asking for help so that’s what I would say. HR: Tremendous and on that note were gonna close up, Becca Lory thank you so much for being our guest today here at Exploring Different Brains. BL: Thank you very much Hackie it was my pleasure. 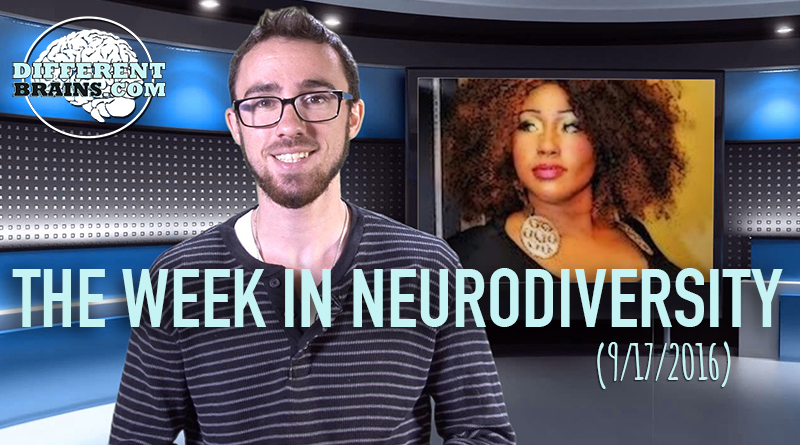 In this episode, a rapper become an autism advocate, patients with Parkinson’s climb Machu Picchu, and have you heard of the Emmy award-nominated reality series about Down syndrome? All this and more! In this episode, Hackie Reitman, M.D. 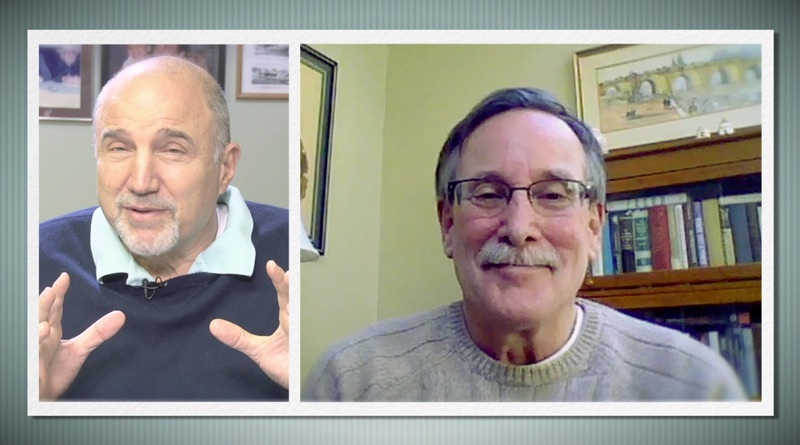 speaks with author and jail diversion team facilitator William Packard, Ph.D.